Cute, lighthearted, and funny, El-Hazard might be just the thing to spice up a warm summer day. So far, it's nothing earth-shattering, but it's an entertaining cross-world fantasy, nonetheless. Somehow, I've never actually seen the animated version of El-Hazard. When you take into consideration that there are two OAV series and two TV series floating around out there somewhere, it seems a bit odd. Perhaps that's why I picked this book up when it arrived at my local Waldenbooks. Regardless of how it came to be, here I am, holding the first manga set within the mysterious realm of El-Hazard. So far, my journey has been an amusing one. Our story begins on Earth (and in Japan, in particular) where we are introduced to Mokoto Mizuhara, the hero, and a number of the other main characters of the story. The first thing we see is Katsuhiko Jinnai chasing after Mokoto for signing a petition to impeach Jinnai from his position as student president of their class. While in the heat of pursuit, a terrible earthquake erupts, tearing the ground below Mokoto asunder. He falls into the earth and finds himself within an ancient temple, enshrining a "divine icon" - a beautiful statue that looks like a heavenly maiden. Mokoto jokingly refers to her as a goddess turned to stone by a demon wizard, and on a whim, feels obligated to kiss her. After all, a kiss is always what it takes to free a frozen damsel, and Mokoto has nothing better to do while his friends rescue him. He is understandably shocked when the statue comes alive as his lips meet hers. She seems to recognize him, declaring her love for him, and apologizing for her lack of power. Then, as Jinnai, his sister Nanami, and his teacher Mr. Fujisawa are climbing down the newly formed fracture, a bright light envelops them all, sending them to El-Hazard, where the mystical woman Mokoto has revived says they will meet again. Thus begins the story of El-Hazard: The Mysterious World. As cross-world fantasies go, it's an adequately dramatic way to toss readers into the fray. Stories like this sometimes can be more entertaining to read than straight otherworld fantasies (that don't have anything to do with Earth) because they have a direct link to our reality. One of the many purposes the fantasy genre serves is to provide a release from everyday life, to allow us to believe that perhaps if we look hard enough, there is some strange land that we might discover, and that magic does exist if you know where to look. Living in a world where magic exists but simply hasn't been found yet is much more exciting than going about your daily business expecting only the ordinary. Such is the draw of El-Hazard, for here, we see an ordinary group of people thrown into some extraordinary situations, all because of a temple that could be buried underneath YOUR school, for all you know. For the most part, this is a fairly comical manga. It's cute, and the action and expressions tend to be over-the-top, but it fits the flavor of the story very well. While not overly dramatic, it does possess the potential for quite a few interesting relationship developments among the characters, which is always a mark of a good story. As we see things from Mokoto's perspective (mostly) there is much we don't learn about El-Hazard in the first volume of the series. The land, characters, and story are interesting enough to leave me eagerly anticipating the next installment of the graphic novel. The artwork, as the story, is not geared toward realism as much as it is toward characterization. The women are all beautiful, and the men tend to be goofy looking. This seems like a book that portrays the evil people as obviously evil and the good guys as obviously good, but there remains plenty of room to change that initial impression. Anyone who has experienced Magic Knight Rayearth knows that it is not always safe to assume you know what is coming. Technically, the book is pretty good. It reads from left to right, but until the traditional "unflipped" publishing method becomes standard, it's hard to blame Viz for releasing it this way. It's a standard sized book (roughly the same dimensions of a DVD case) and priced at $15.95, another industry standard. 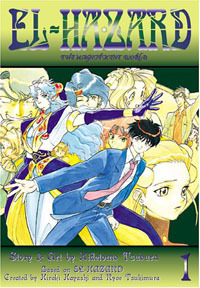 It includes five pages of line art that details the differences between some of the characters in their various incarnations (one of the four animated series or the manga). It's a nice touch, and something that would be welcome in other manga, as well. In general, this is a nifty book with an intriguing story, and I'll be happy to pick up the next volume whenever it arrives. If you like epic fantasies, then this should be right up your alley. It's not as serious or deep as the superlative Nausicaa, nor is it as dark (so far) as Sorcerer Hunters, but it's undeniably fun to read.